The Trail of Painted Ponies believes that inside each of us is an artist, waiting to be discovered. We would like to personally invite you to become a Trail of Painted Ponies artist. 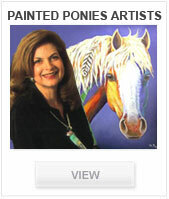 The title of Official Painted Ponies Artist is an honor and it is accompanied by an array of opportunities. Learn the Top 10 Tips for Painting Ponies and see videos that offer invaluable suggestions so that you can submit your own designs. Take a moment to look through the Artist’s Directory and learn about the artists from The Trail. Competitions are held regularly and everyone is invited to participate, plus we are always accepting design submissions.